This is the second part of our independent review of bonded broadband solutions from UK-based Evolving Networks. In our first review, we tested the bonding of two DSL connections. In this article, we present the results from bonding three and four DSL connections. Using individual ADSL2 lines capable of delivering downlink throughputs of about 5.5 Mbps, we were able to achieve aggregated throughputs of over 15 Mbps and 20 Mbps with three and four lines respectively, with low levels of latency (delay). Our results show that there is no law of diminishing returns when bonding more than two lines together. Here is a screen capture of the eViewLive system, which shows four lines being bonded to give downlink throughputs in excess of 20 Mbps. While our testing was delayed due to a faulty line, this problem demonstrated the role that proactive line optimisation (a critical part of the Evolving Networks service and a key differentiator for the company) can play in achieving the very best performance from bonding. ISPs offering single-line broadband solutions could learn a lot from the Evolving Networks approach to allow their customers to achieve the best speeds possible. Over the past few weeks, we’ve had the opportunity to comprehensively assess the performance of ADSL bonding using two, three and four lines from Evolving Networks. It would be easy in an ADSL bonding review to neglect the consideration of the individual DSL lines themselves in favour of the bonding technology and associated hardware. However, during our review, it became increasingly clear that individual lines play a critical role in defining the performance of broadband bonding as a whole. Never has the old adage ‘garbage in, garbage out’ been truer. Bonding delivers the very best results when individual lines have been optimised to deliver the best speeds and performance possible. Furthermore, a single faulty line can significantly degrade overall throughputs and the perceived performance of bonding. Rapid changes in throughput on a line can cause the bonding system to struggle to keep up with the rapidly changing line conditions. Despite the huge performance variation that can occur, most ISPs do not undertake any form of proactive line optimisation and will only respond if customers complain of particularly slow speeds or intermittent service. How many broadband users actually realise that their connection could potentially deliver significantly greater performance? This is a missed opportunity! results from its own speed and latency line tests. Evolving Networks analyses the performance data for individual lines to understand if they are performing optimally. Since multiple lines are deployed, Evolving Networks is able to see if significant performance differences exist between lines, which can be immediately investigated. Evolving Networks also ensures that ADSL2+ equipment is used where this is available (to provide the highest possible uplink speeds). The value of this proactive line optimisation was clearly demonstrated to us since we actually suffered from a particularly frustrating, and intermittent, fault on one of our lines. This issue caused spikes in latency and erratic downlink throughputs (varying from 5.5 Mbps down to 0.5 Mbps) on the line, and substantially affected overall bonded downlink throughput. After a prolonged period of time (and following comprehensive data analysis and several visits by an Openreach engineer), we were finally able to get four lines with consistent performance and excellent speeds (given the distance from the exchange). 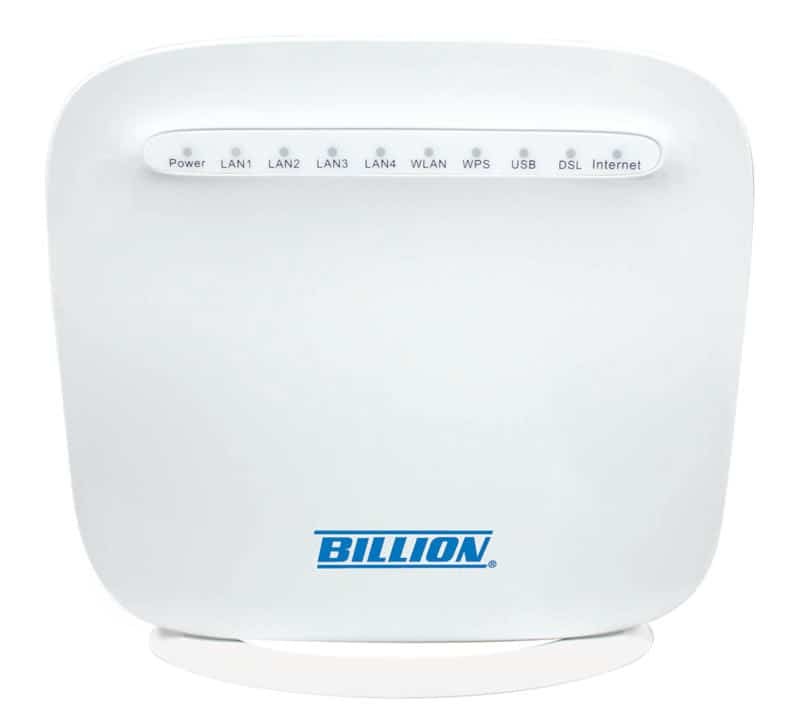 Our problem line was improved by changing the modem to the new Billion 8800NL modem router (shown above). Evolving Networks is currently trialling Billion modems to potentially give even more control over line settings, including the target SNR margin (Signal to Noise Ratio margin). As can be seen in the table, below, we ended up with four individual lines with very similar performance, with single-line throughputs in excess of 5 Mbps and low latency. Two of the lines had been installed by Evolving Networks (lines 1 and 2), while lines 3 and 4 were already in place. Evolving Networks strongly prefers to install new lines for its bonding service so that it can optimise the connection to its own private network and minimise overall network delays. As can be seen in the table, the pings for the lines installed by Evolving Networks were indeed noticeably lower than those of the existing lines. Evolving Networks has developed strong competence and unique systems for the optimisation of individual broadband lines. While the focus of this review is on bonded broadband solutions, these would be of great value to premium ISPs offering single-line solutions. For our review of ADSL bonding with two connections, we used the smallest of the bonding gateways offered by Evolving Networks (called the EV1). This is a small unit of dimensions 15.6 cm x 16.8 cm x 2.7 cm, and weighs 440 g. This can support two lines and has a maximum bonded throughput of 30 Mbps, making it suitable for the bonding of two ADSL2+ lines each with downlink throughputs up to about 15 Mbps. For the bonding of three ADSL connections, we were provided with the larger EV3, shown in the photo below (next to the smaller EV1). Dimensions of the EV3 are 21.5 cm x 18.9 cm x 4.4 cm and the weight is 1.25 kg. The EV3 can bond together up to three connections and has a maximum bonded throughput of 90 Mbps - more than enough for our purposes. The EV3 is able to bond ADSL2+ or FTTC fibre broadband connections. When the EV3 was first switched on, the device was relatively noisy as the onboard fan started at full speed in start-up mode. However, the fan very quickly slowed down and, in normal operation, it was inaudible in what was a very quiet office. We have very little to report about the bonding service as it simply delivered excellent and consistent performance. Just as with the bonding of two connections, we enjoyed a very fluid browsing experience with no slowdowns, and speed tests consistently measured throughputs in excess of 15 Mbps (downlink) and 2.3 Mbps (uplink). As with our two line bonding tests, there was no evidence of network contention or congestion issues. Table 2, below, shows the measured throughputs from bonding, averaged across a number of speeds tests. As discussed in our first review, there is always a performance overhead due to the way the bonding process works. As shown in the table, the ADSL bonding service with three ADSL connections delivered about 94% of the combined downlink throughputs of the individual lines. In the uplink direction, bonded ADSL delivered about 93% of the combined uplink throughputs. The performance overheads were, therefore, very similar to those measured with two bonded connections i.e. very low. In other words, broadband users can expect the same additional speed benefits from adding a third line as they get when adding a second line. There were no signs of diminishing returns from adding a third line. The average ping (for the BBC website) was just over 20 ms, as shown in the table below, which is an excellent result given our distance from the exchange. The Evolving Networks three-line bonding added only about 4 ms of latency (delay) over the average latency of the individual lines. This is impressively small and demonstrates that bonding does not degrade quality in any noticeable way. Through optimisation of the network architecture and the transmission parameters, Evolving Networks is able to minimise the latency of the individual lines meaning that, even with bonding, delays may be lower than typical ADSL lines without bonding since the slight latency increase from bonding is often offset by the reduction in latency on the individual lines. Packet loss was negligible. Even though Evolving Networks had provided two ADSL lines for our trial, we had a total of four lines into our office, so we were keen to test the bonding of all four ADSL lines! To enable us to do this, Evolving Networks sent us a new bonding gateway - its most powerful EV7 device (shown in the photo below on the right, which is next to the EV3 on the left). While the maximum throughput capabilities of the EV7 (500 Mbps) are substantially in excess of the throughput requirements for bonding our four connections (each delivering 5 Mbps+ throughputs), we will be keeping the EV7 to test the bonding of multiple FTTC connections when fibre broadband services become available to us in the next few months. Compared with the EV1 and EV3 models (which can be located on a desk top), the EV7 is a much more substantial device, weighing about 11 kg. It is expected to be rack mounted, for example in a dedicated server room. Dimensions of the EV7 are 43 cm x 30.5 cm x 4.4 cm. Lifting the EV7 really brings home that bonding with high throughputs requires significant processing power. Evolving Networks differentiates itself from other bonding providers in being able to deliver extremely high throughputs, up to 500 Mbps, so it can easily bond multiple fibre broadband FTTC connections together. In operation, the onboard cooling of the EV7 makes it unsuitable for a quiet office environment where the fan noise would be quite distracting. We placed the EV7 in our own dedicated server room, where it performed faultlessly. Bonding of our four lines using the EV7 delivered a similar user experience to the three-line bonding set-up, albeit with even greater throughputs. We consistently achieved downlink throughputs in excess of 20 Mbps, with uplink throughputs in excess of 3 Mbps. There was negligible packet loss. Latency measurements were virtually identical to our three-line testing (so are not shown here), with an average overall ping after bonding of about 20 ms. Detailed throughput test results (shown in the table below) revealed that, even with four lines, there were still no signs of diminishing returns with bonding, with the service delivering about 93% of the combined single-line downlink throughputs. The fact that Evolving Networks has customers that are bonding up to seven ADSL connections demonstrates that there are no practical limits to the technology. In our first review, we demonstrated the value of resilience. By disconnecting one of the two lines, we showed that service was maintained (albeit at half the original bonded throughput). Increasing the number of bonded connections increases resilience further. For example, we confirmed that the four-line bonded connection continued to work satisfactorily when one, two and three connections were disconnected. All in all, we have continued to be very impressed with the bonding solutions offered by Evolving Networks, which combine leading-edge hardware and a contention-free private network. Not only this, the company uniquely offers line optimisation to maximise the speeds of individual lines. While being surrounded by properties typically being only able to achieve downlink ADSL throughputs in the 0.5 to 4 Mbps range, we have been able to exceed 20 Mbps with ADSL bonding, which is close to 'superfast' speeds! Businesses need to be made better aware of the existence of ADSL bonding since bonding could significantly benefit many types of organisation struggling to cost-effectively enhance broadband speeds. This site is provided by Dr Mark Heath, Broadband Champion for Connecting Cambridgeshire.